Congratulations to Pittsburgh International Airport for being the very first United States airport to be named Airport of the Year by Air Transport World Magazine! We are thrilled to have such a first-class facility in Pittsburgh, and we are proud to have contributed to their success by providing them with modern plumbing fixtures and upgraded drinking water solutions. Equiparts has facilitated many updates to the Pittsburgh International Airport to increase traveler comfort and improve airport ambiance. Major updates included selecting and procuring new drinking fountains, bottle filler units, and new restroom fixtures. With support from our vendors such as Sloan and Elkay, we helped the airport choose the best solutions for their facility. One of our knowledgeable representatives, Joe Ferraro, worked directly with the head of plumbing, as well as other key maintenance personnel at PIT Airport to implement these upgrades. As an outside sales rep at Equiparts, Joe frequently works with our Pittsburgh area customers on site to provide hands-on support. Joe continues to work with the maintenance department at PIT airport as a knowledgeable source for all of their plumbing and maintenance needs. Patrons of the airport cannot bring opened containers through checkpoint locations. That is one of the reasons why it is important that an airport has water coolers placed directly before and after security checkpoints, as well as throughout the airport, to make drinking water easily accessible. So far, Equiparts has added over 30 new water coolers throughout the airport. We have also added over a dozen bottle filler water cooler units to the Airside concourses where the majority of the shops and restaurants are located. The water cooler and bottle filler units we supplied are made by Elkay Manufacturing. These stainless steel units include the Vandal Resistant Bi-Level Water Cooler and EZH2O Bottle Filling Stations (View on our website). These multi-level units accommodate children and adults and allow two people to drink simultaneously, which is ideal for an airport, given the heavy traffic and the need for ADA compliance. Joe used his experience and expertise to help Airport personnel select the best new fixtures for the airport’s needs. Fixtures such as new faucets, flush valves, urinals, as well as American Standard sinks and soap dispensers were provided to upgrade the airport’s restrooms. Most of the new units chosen for these updates were from Sloan, for which Equiparts is a master distributor. PIT Airport updated their restrooms with top of the line Royal flushometers for urinals and closets, as well as electronic sensor faucets. All of these fixtures provide the highest quality in terms of functionality, appearance, and longevity. The PIT International Airport is constantly striving to improve the user experience for all of its travelers. We will be there to support them in any way we can, as their #1 source for plumbing and maintenance repair parts and fixtures! Decrease plastic waste and encourage environmental responsibility by becoming an advocate for bottle filling water fountains. Introducing: Bottle Filling Hydration Stations. These units encourage the use of refillable water bottles instead of buying plastic and then throwing it away. Bottle filling stations, such as this ezH2O unit by Elkay, can be placed in your workplace cafeteria, your child’s school hallway, or in your university campus classroom. 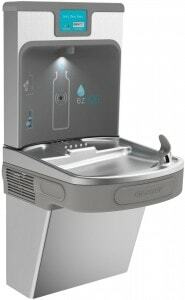 EZ Bottle Filling Stations come in a wide variety of styles, including vandal resistant units, bi-level fountain units, retrofit units for existing EZ water coolers, surface mounted or in-wall units, architectural units, as well as outdoor bottle filler units, (including units with low fountains for dogs). No matter what location you have in mind, there is a unit that fits it. These units can be used as just a fountain, supplying room temperature water, or they can also be used as a water cooler and supply refrigerated water. Energy Saving Mode: Water Cooler Bottle Filler units can be scheduled to turn off refrigeration during times of low or non-use to save energy, and simply dispense ambient water during set times. Green Ticker™: Most units have an electronic indicator that counts the number of 20-ounce bottles saved, known as a Green Ticker™. Sensor Controlled/Automatic Shut-Off: Some units are sensor activated, allowing touchless, sanitary operation, with an automatic 20 second shut off. Low Energy LED Filter Status: Filtered units come with a visual filter monitor with green, yellow, and red LED lights that signify when a filter needs to be changed. So help us decrease the average plastic bottle usage from 167 a year per American, to 1 bottle that we refill. 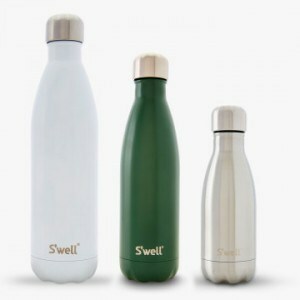 That one bottle you use every day could be a statement too, like these beautiful, heavy duty reusable bottles from S’well. Make an impact where you live, work, and play. Share the power of the Energy Saving Bottle Refill Station, and help your facility become more environmentally responsible while supplying an amenity to your students, faculty, and/or patrons. Share this article on Facebook, Twitter, and LinkedIn, or email it to your boss, the owner of your building, your friend on the school board, and the facility manager that lives down the street. Be an advocate for an environmentally friendly water source and help make a positive change in your corner of the world this Earth Day, and every day thereafter. Find out which bottle filling unit is best for your unique situation by consulting with an Equiparts water fountain specialist: 800-442-6622 Monday-Friday, 7:30 AM-5:00 PM EST, or filling out our contact form and a specialist will get back to you with more information. Get Motivated to Become Water and Energy Responsible in 2016. What will you do to make a difference?